NEWS: Dylan Collard's Ages of Us — GRIPVAN Gripvan - Photographic Equipment Rental made easy! A selection of images from Dylan Collards’ recent project ‘Ages of Us’ will be hanging in the reception of advertising agency Mother until February 13th The Project involved travelling with the same Green bench to different locations in the USA and for the opening night of his exhibition Dylan wanted to recreate the feel of his project for the exhibition-goers and capture their portraits on the same green seating he had brought back from America. Gripvan were called on to rig the painted canvas desert background for the set and solve the issue of having to light the set without using any floorspace. We opted to rig a lighting bar from eyebolts in the 6.5M ceiling and light the set with two Litepanels Astra LED panels balanced to the same colour temperature as the existing tungsten lighting at Mother. We finished off with tungsten Dedo 150’sand Arri 1kw fresnels lighting Dylans work from any suitable spots we were able to rig to. Cassie Thistle, 29, Yosemite National Park, from the series 'Ages of Us' by Dylan Collard. "Cassie was travelling with her family and we met her, her brother Luke and her mom at a picnic area just off the main road. Much friendlier than her Chawawa, Cassie told us about a childhood interest in horses that had turned into a respect / love for animals and a current job working with them." 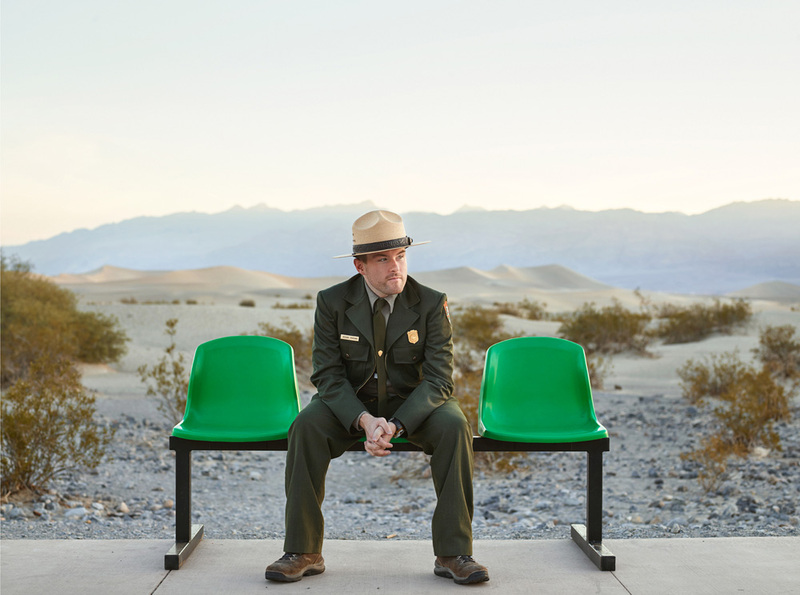 Keegan Donovan, 29, Death Valley, from the series 'Ages of Us' by Dylan Collard. "A ranger since he was 19 years old Keegan talk to us about his background in theatre / public history and how he sees the primary role of a ranger being to protect the memory of a country. We were only allowed to shoot in Death Valley between sunrise (about 5.30 - 6am) and 9am OR until the temperature hit 100f. As the sun came up Keegan and Matt old us tales about rescuing people from the desert, about those who didn’t make it like “Beef Jerky man” and about the beauty of the valley and living in such a remote location." Yanna In’tveld, 19, Red Rock Canyon (Blue Diamond Road), from the series 'Ages of Us' by Dylan Collard. "Yanna was part of a school / university trip from Sweden that had been travelling the US. We’d pulled in and set up at another Gas Station and a bus pulled in and I’d noticed a couple of people who turned out to be the teachers / group leaders. I told them what we were doing and persuaded a couple of the guys to come and sit of me. At this stage I didn’t realise they were travelling with a bus full of teenagers, so I wandered back over to see who else I could round up." Maliea Stewart, 25, Red Rock Canyon Overlook, from the series 'Ages of US' by Dylan Collard. "We met Maliea and a few of her friends in Red Rock Canyon as the sun was setting. It was Maliea’s 25th Birthday that day and they were full of beans and excitement about our shoot and Maliea’s tiara! We shot another couple here who turned up with an Elvis impersonator vicar (who arrived in a red Cadillac and was wearing a Hawaiian shirt) as they were about to get married right here at Red Rock Canyon." Dan Blacksmith, age unknown, Ludlow CA, from the series 'Ages of US' by Dylan Collard. "Dan was a truck driver who wandered past our bench, chatted to Greg about his rig and then agreed to sit for me. He wasn’t interested in seeing or having any of his shots but was calmly happy to help us out. As we left I looked at the map to see where sat nav was taking us and realised that the road we’d set up on was the very end / start of route 66 before it became the dirt track that is Crucero Road. The yellow lines that lead into the bench are the centre lines of Route 66." Heidi and Jane Grunt, 33, 53, 74, Joshua Tree, from the series 'Ages of US' by Dylan Collard. 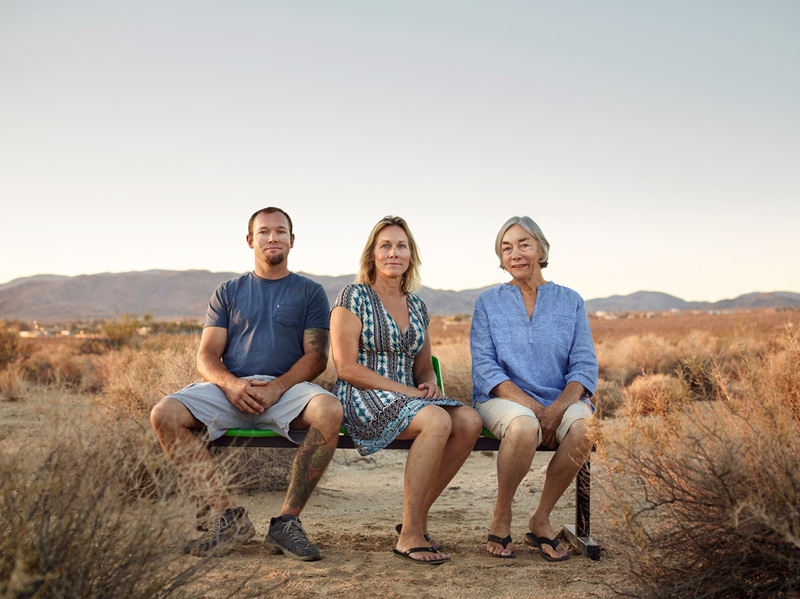 "This is 3 generations of the Grunt family who run and own the 29 Palms Inn at Joshua Tree National Park. When I was a student I won the Ilford Student Awards, the prize being a trip around California with a photographer. One of the places we stayed at on that trip was the 29 Palms Inn and its a place I loved and always wanted to return to. So I made their hotel one of the focal points of my trip and arranged with them that I’d photograph each generation of their family as part of the project." ‘Ages of Us’ is a documentary project by photographer Dylan Collard. The series explores the process of ageing; the effects of that unstoppable process on our physical being and how our attitude, conscience, hopes, aspirations and desires change as we go through the stages of life. Age is one of the great and incurable mysteries of science – we are told that lotions, potions, diets and lifestyle changes can slow, change and increase the effects and duration of this process, but nothing can halt the inevitable destination. For ‘Ages of Us’, 165 participants were photographed and recorded in 23 locations during a 3000 mile trip through one of the ‘So Cal’ tourist loops in California in 18 day days, beginning and finishing in LA. Audio recordings accompany the photographs, printed as Lambda C-type prints for the exhibition, questioning perceptions of age, generations, the journey of life and how our priorities change as we travel through the three stages of Youth, Middle and Old Age. Throughout the series, the bench that the participants were seated on remained the same distance, angle and height to the camera at all times. In the left seat (to camera) we find the 0-25 years olds, in the middle seat the subjects were 25 – 50 years old, and in the right seat 50 + year olds. The bench will be displayed at the Private View of the exhibition, set against a backdrop of an American landscape. Visitors will be encouraged to sit and have their photos taken and these will be added to the project website and social media platforms to become a part of the project. Past: When you were a child what did you want to be when you grew up? What was important to you when you were young? Present: What do you do now? What sort of things does your life involve now? What kind of work do you do , family, relationships? What’s important to you now? Future: What would you like to do in the future, what’s left, what plans do you have for the future? Following college in The North and a few years as a bass player, Dylan Collard moved to London 1998 and started assisting. Since becoming a commercial photographer, Dylan has shot work for the likes of Pfizer, Adidas, O2, Santander, and The Discovery Channel. Much of his work involves shooting real people on location using lighting and details to convey a sense of narrative about his subject. He works from his studio in South London and is a much better photographer than he was a bass player.